The product designation U-MB stands for "Universal Modular Boiler" (three-pass steam boiler in modular construction). This boiler type consists of several modules, which fulfil your individual requirements perfectly. The boiler components are configured with a focus on low emissions, high steam quality and optimum energy efficiency. The boiler's modular construction based on the systematic deployment of design elements and parts that are also used in other type series ensures a very favourable price-performance ratio. The classic areas of application of the U-MB steam boiler are the food and drinks industries, laundries and dry cleaners, and smaller industrial companies. The U-MB steam boiler is a three-pass flame and smoke tube boiler. It consists of several modules, namely the heat generating section in three-pass construction, the steam chamber on top of this, and an integrated economizer. Since it is a genuine three-pass boiler, there is no need for flow fittings in the smoke tubes. 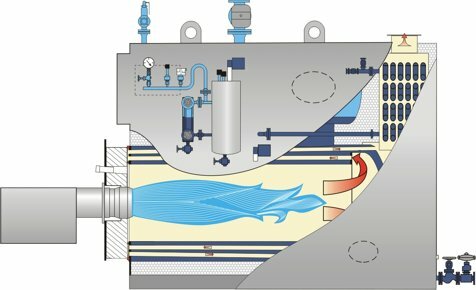 The heat generating section of the U-MB is based on the UT boiler design - which has proven its worth over the course of decades and in thousands of applications. The generous flame tube design promotes an efficient combustion process. The choice of steam section has a critical influence on the steam quality. A large steam section provides better residual steam moisture. The integrated economizer has a direct influence on energy efficiency. The heat in the flue gases is used for preheating the boiler feed water, and it is therefore recovered to a large extent, which reduces fuel consumption and emissions. The steam generator is type-tested and is manufactured to the strict guidelines of the Module D Quality Assurance System of the Pressure Equipment Directive. The Universal U-MB boiler is supplied as a complete, fully equipped unit. This includes the insulated boiler with pre-fitted equipment, the boiler control cabinet, and a low-emission burner.